The stallplate of James, 4th Duke of Hamilton, is found amongst the many hundreds of stallplates that adorn the quire of St George’s Chapel. These stallplates seem like jewelled windows, providing brief glimpses into the history of the Order of the Garter. 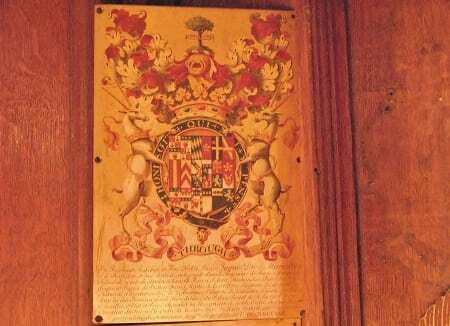 The coat-of-arms, style and achievements of the Duke glint brightly when the light falls on them, but intriguingly, it is perhaps the date of the Duke’s installation, August 4th1713, that is the most dazzling feature of the Duke’s stallplate. Why? On this date, James, 4th Duke of Hamilton was dead. James, 4th Duke of Hamilton, was a Scottish nobleman, born to William Douglas, 1st Earl of Selkirk, and Anne, 3rd Duchess of Hamilton, in 1658. He had a strong claim to both the Scottish and English thrones through his mother, a descendant of James I on her paternal side. As Earl of Arran, he was appointed a Gentleman of the Bedchamber by Charles II, and was an ambassador to the court of Louis XIV. Following the Glorious Revolution, he favoured the deposed James II, while his father supported William III. His father died in 1694, and his mother surrendered her titles in 1698 to William III, who granted them back to Arran that same year. As Duke of Hamilton, he took his seat in the Scottish parliament in 1700. He opposed the union of England and Scotland, but his own political stance oscillated between the parties involved. Following the union, he entered the parliament as a representative peer in 1708. The Duke’s profile rose with the success of the Tory party, culminating in his election as a Knight of the Garter on October 26th 1712. In 1712, he was also appointed as an ambassador to Paris, where he was due to travel before his infamous duel with Charles, 5th Baron Mohun, a Whig supporter, on November 15th 1712. The duel between the Duke and Lord Mohun was the culmination of a ten year inheritance dispute. In 1702, the 3rd Earl of Macclesfield died without an heir. The Duke’s second wife, Elizabeth Gerard, was a granddaughter of the 1st Earl of Macclesfield, so he laid claim to the inheritance. Lord Mohun’s estranged wife, Charlotte Orby, was also a granddaughter of the 1st Earl, while Lord Mohun was the named heir of the 2nd Earl of Macclesfield, so he too, laid claim. After years of litigation, Lord Mohun challenged the Duke to a duel. Lord Mohun was no stranger to duelling. He had been tried on two separate occasions for murder but he was acquitted both times. On the morning of November 15th 1712, the Duke, with his second, Col. John Hamilton of the Scots Guard, met with Lord Mohun and his second, Lt. Gen. George MacCartney, in Hyde Park. At about 7am, the men engaged in a fierce duel. An article in The Post Boy relates the extent of the wounds suffered by both men, including a wound in the Duke’s left breast that ran ‘downwards into his body’ and a wound through the right side of Lord Mohun’s body ‘up to the hilt of his sword’. The wounds suffered by both men proved fatal. However, based on the reports of Col. Hamilton, the Duke’s second, news began to circulate that the Duke had been fatally stabbed by Lord Mohun’s second, Lt. Gen. MacCartney. Col. Hamilton testified that Lt. Gen. MacCartney had thrust his sword through the Duke’s left breast. This news spread rapidly in London, and in a letter dated November 18thwritten by the Duke’s friend, Jonathan Swift, he recounts, ‘we suspect Maccartney stabbed the Duke while he was fighting. The Queen and Lord Treasurer are in great concern at this event’. The claims, in turn, led to stories that the duel was part of a Whig-orchestrated conspiracy to get rid of the Duke, a claim much debated by many at the time, including Jonathan Swift and Daniel Defoe. Although the Duke of Hamilton had been elected as a Knight of the Garter shortly before he died, he had not been installed as such. The matter of the Duke’s death, however, proved to be a surmountable obstacle. On August 14th 1713, James, 4th Duke of Hamilton, was one of six noblemen installed as Knights of the Garter. The then sovereign, Queen Anne, took the unusual step of issuing a particular dispensation that allowed for the installation of the Duke. Perhaps desirous of commemorating the Duke’s election to the Order, the dispensation authorised the inclusion of the Duke’s name among those who received installation. In issuing such a dispensation, Queen Anne ensured that James, 4th Duke of Hamilton, would be included in the history of this illustrious Order.